Looking to start your own trucking company? Today is the day to start to make the one of the best decisions of your life. There is no better time to get your DOT Authority and start a new trucking company. Being an owner operator is one thing, but getting your own authority is a whole new life changing event. Starting a small business is the American dream and we support everyone who goes that path. If this sounds like something you’ve been dreaming of, make sure you get everything prepared by following our checklist. You operate interstate (across the state and international lines). You transport passengers or cargo. Your vehicle has a total gross or combined weight of 10,001 lbs or more. If you meet all three of these criteria, you must register with the FMCSA and obtain a DOT number. This is also granted by the FMCSA. It is the authority issued to interstate for-hire carriers. Additional authorities may need to be obtained depending on your business’s operations and cargo. 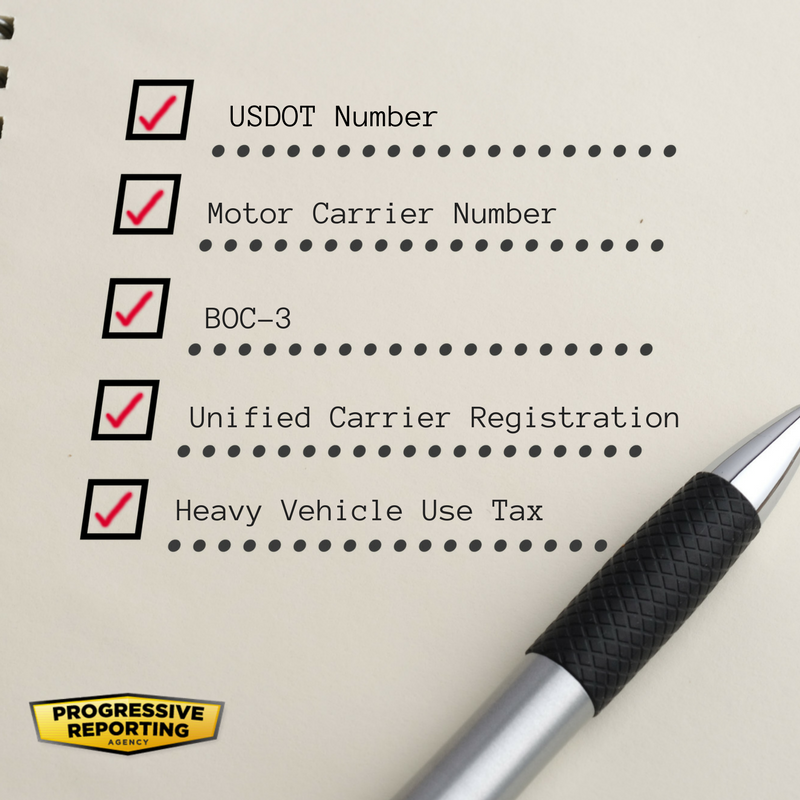 Progressive Reporting can help you decide which Motor Carrier number you need and with the process of getting it. The blanket of coverage, also known as the BOC-3, must be filed with the FMCSA before your Motor Carrier number will be activated. The BOC-3 designates process agents in all states that your business operates. The UCR is a federally mandated, state administered program for the registration of interstate carriers in the US, Canada and Mexico. Like the DOT number, UCR is required for vehicles weight 26,001 lbs or more. This license must be renewed annually, and businesses will be charged an annual fee based on the number of vehicles they own or lease long-term. The IRP is required for all interstate carriers with vehicles weighing over 10,000 lbs or with 3 or more axles. IRP licenses must be renewed each year, however, the deadlines vary by state and are often staggered based on the month in which you first register. If you aren’t sure when your renewal is due, just give us a call and we can help you out. The IFTA is required for all interstate carriers with vehicles that weight over 26,000 lbs or have more than 3 axles. Not only must this license be renewed annually, but registrants are required to submit quarterly reports of their mileage and fuel use broken down by state. Any fuel tax owed must also be submitted at the time of filing. To determine which state is your base jurisdiction and for tips on proper IFTA record keeping, contact us today. HVUT is an annual federal tax levied on commercial vehicles that weigh 55,000 lbs or more and that travel at least 5,000 miles on public highways throughout the year. Whether you’re an interstate or intrastate carrier, you must pay your annual HVUT if your vehicle meets the criteria above. After filing, you’ll receive a stamped Schedule 1 as confirmation. This is a piece of paper you want to keep on hand as a current stamped Schedule 1 is required to renew your tags, renew your UCR and more. If you stay entirely within the boundaries of your state then most of the above will not apply to you, except you might have to get a DOT number. Many states now require DOT numbers for intrastate for-hire carriers. It’s also possible that your state has an additional state use tax. You can learn more about all the different pieces of getting your operating authority in our comprehensive trucking industry glossary. Once you make it through all the hurdles of obtaining your authority, then comes the work of maintaining your authority correctly. At Progressive Reporting, we can help you get your business moving and continue to move by helping you fill out your quarterly and annual filings. To see how we can help you establish and maintain your business, view our services.